​For the second straight year, an Oklahoma quarterback has won the AP College Football Player of the Year. 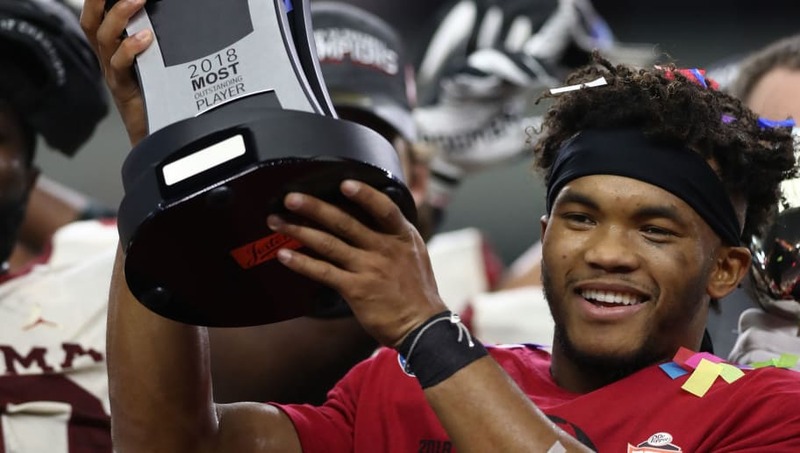 A year after​ Baker Mayfield won it, Sooners quarterback ​Kyler Murray is coming home with the award, beating out Alabama quarterback Tua Tagovailoa. ​​"It's humbling and an honor to be named AP Player of the Year, to be mentioned in the same realm as a lot of great players, a lot of hall of famers," Murray said. "It's a special deal for me and hopefully I can continue to make my family and teammates proud." ​​Murray received 39 first-place votes and total of 145 points, whereas Tagovailoa received 13 first-place votes and Ohio State Buckeyes quarterback Dwayne Haskins Jr. received four first-place votes. All three of these players are finalists for the ​Heisman Trophy, which will be awarded in New York City on Saturday night. Murray becomes the fifth Oklahoma quarterback to win this award, joining Mayfield (2017), Sam Bradford (2008), Jason White (2003) and Josh Heupel (2000).